Popovici Nițu Stoica & Asociații has made 13 internal promotions following the Firm’s annual performance appraisal. These promotions comprise nine Managing Associates and four Senior Associates from a wide area of expertise covering: Competition & Antitrust, Corporate/M&A, Data Protection, Employment & Pensions, IP, Litigation, Real Estate, Public Procurement, Restructuring & Insolvency, Tax and TMT. Ana-Maria Vlad (Real Estate; Corporate/M&A). were promoted to Senior Associates. ‘These promotions are part of our Building from within vision and of our commitment to recognize and promote the performance. Our team now has 19 Managing Associates and 16 Senior Associates, most of them having been with us their entire career,’ said Managing Partner Florian Niţu. Popovici Nițu Stoica & Asociații is a leading Romanian independent law firm and has been at the forefront of the market since its incorporation in 1995. 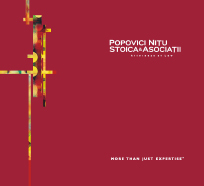 Popovici Nițu Stoica & Asociații groups today more than 80 lawyers and counsels, including 11 partners, largely acknowledged as top-notch commercial law experts, by clients and peers.